This picture shows a lesser water boatman, possibly Corixa punctata, in the typical statue: on the two middle legs, tilted forward and the swimming legs spread out sideways. The right swimming leg is pointing towards us, it is the 'dark smudge' before the body side. That leg's hip is pictured more sharply, two rows of little thorns are visible. The short front legs with their sieve hairs hang below the snout like a feeding basket. Under the belly we see the breathing air, also under the wing borders (the light striping). 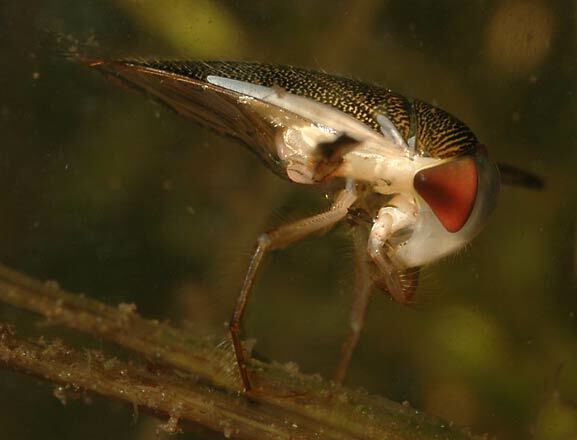 Watch the streamline of the lesser waterboatman, a waterdrip form. Between the head and the chest, is the narrow neck, which is not visible thanks to the presed profile.